In some small veterinary clinics or, for example, if a veterinarian just does home visits, there may be no facilities available to hospitalise a cat. In such situations, for a clinic to be an accredited ISFM Cat Friendly Clinic it is necessary to have a formal arrangement with another local clinic where hospitalisation can be undertaken. 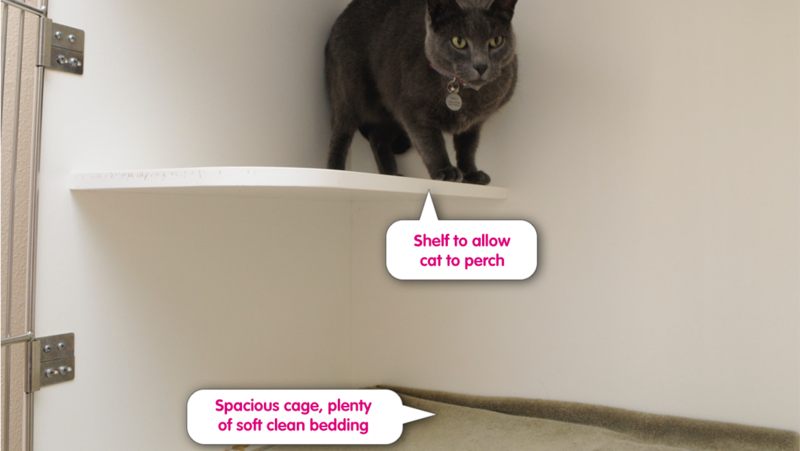 Additionally, at the clinic where hospitalisation is offered, the facilities must at least meet the Cat Friendly Clinic Silver criteria (see below). 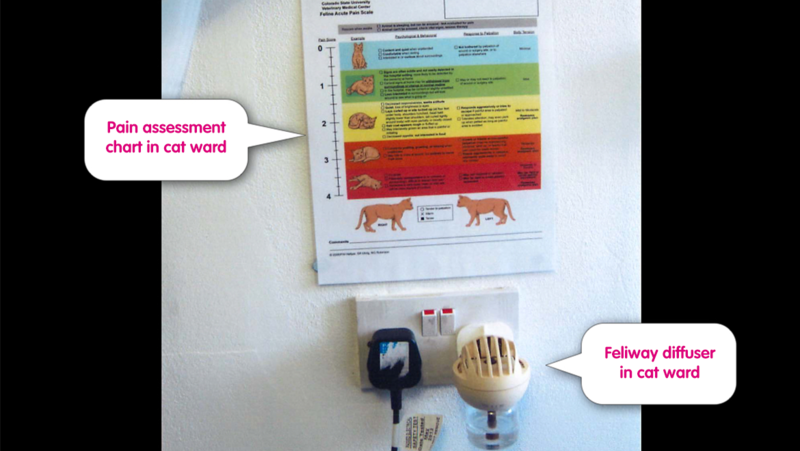 In all other cases, where hospitalisation facilities exist, to achieve Cat Friendly Clinic status they need to meet the relevant ISFM criteria. 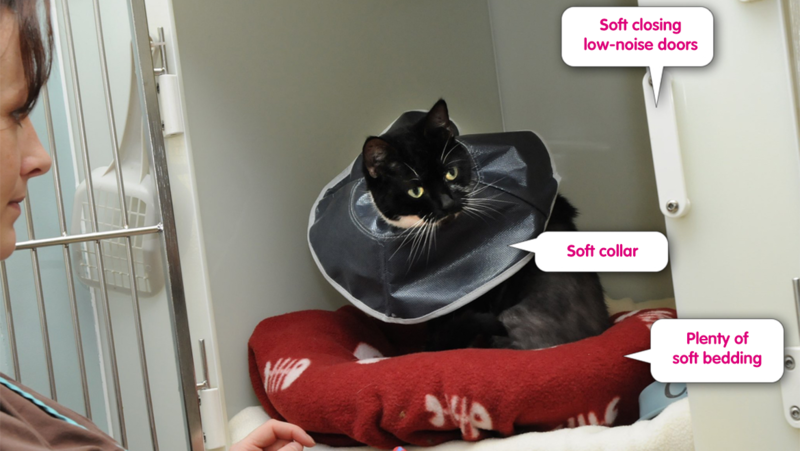 Hospitalisation criteria are an important part of the Cat Friendly Clinic programme, as the welfare of cats during a stay in a veterinary clinic is vital. 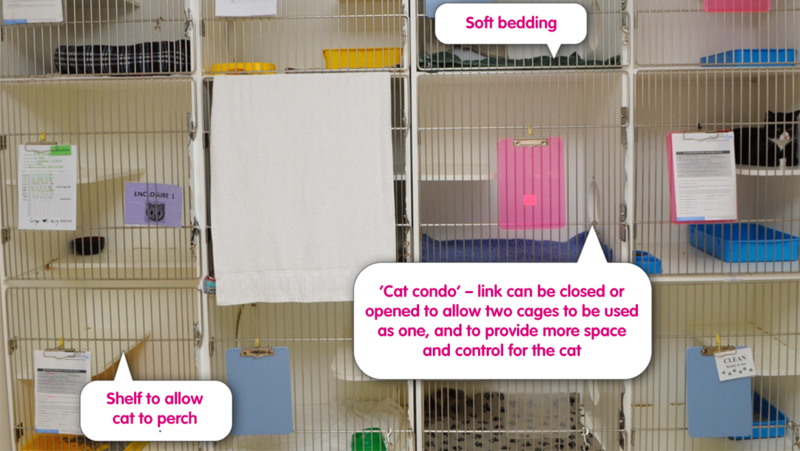 The hospital ward (room in which the cats are hospitalised), hospital cages and the cage furnishings are all critically important to creating a calm environment and reducing stress for a cat staying in a clinic. 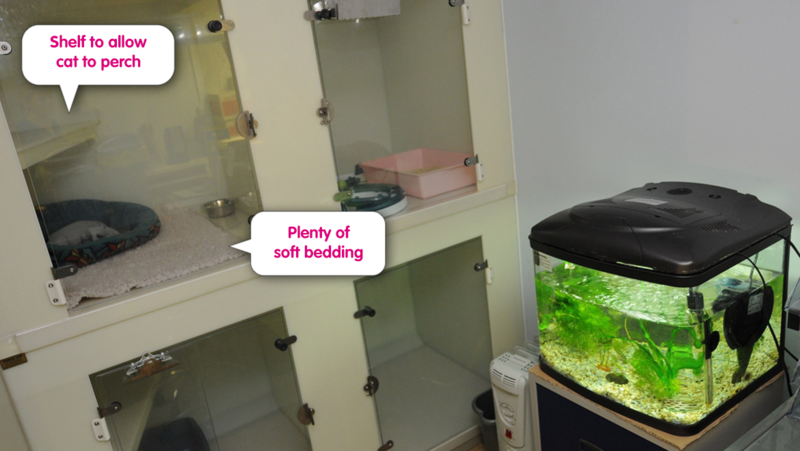 If hospitalisation facilities are available within the clinic, to achieve Cat Friendly Clinic status, they must meet the Silver or Gold criteria. If a clinic does not have its own facilities to hospitalise a cat, it must make use of an alternative location where at least Silver level criteria for hospitalisation is met. 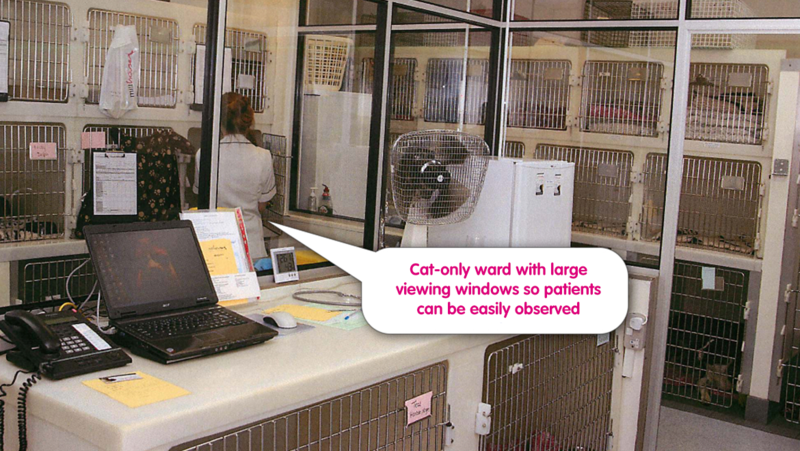 If a separate room/ward is not achievable for hospitalised cats, then dogs and cats should be separated from each other as far as possible within the hospital ward, and ideally barriers used to prevent cats seeing dogs and vice versa – the best solution is to have some form of barrier between a dog and cat section of the ward. Ideally, cats should be hospitalised in a ward (room) that is physically separated from a dog ward (ie, two separate rooms). This greatly reduces stress for the hospitalised cat and is a requirement for an ISFM Gold Standard Cat Friendly Clinic. Regardless of whether there is a separate cat ward, cats should be hospitalised in a quiet, relaxed, comfortable environment. Noise should be kept to a minimum and very bright harsh lighting should be avoided unless there are times when this is absolutely needed. Ideally, cats should not be able to see each other, again to reduce stress. A configuration where there is a single bank of cages on a wall is ideal (with no cages opposite). Having a single bank of cages also reduces the risk of spread of infection (for example via sneeze droplets). If cages do face each other (directly or at an angle) then to prevent aerosol spread of infection there should be a minimum gap of 2m between the closest parts of the cage. Alternatively a solid opaque barrier can be used between the cages to act as both a sight and sneeze barrier. It is important that hospital cages for cats are secure and escape-proof. They should be constructed of solid material that is easily cleaned and disinfected. Plastic and fibre-glass are warmer to the touch than metal, although insulated metal cages can overcome this problem. The walls, floor and ceiling of the cages should be solid and opaque (to provide an effective sight and sneeze barrier) and easy to clean. The front of the cage may be metal mesh, glass or plastic but should allow easy vision of the interior of the cage. Glass or clear plastic fronts have the advantage of providing a sneeze barrier and the lower half of the door can be translucent providing some sight barrier for the cat which may reduce stress. Door latches (to secure it closed) can often be very noisy as these are frequently constructed of metal. Providing a plastic cover or stopper to reduce noise and allow quiet opening and closing of the cage is highly desirable. 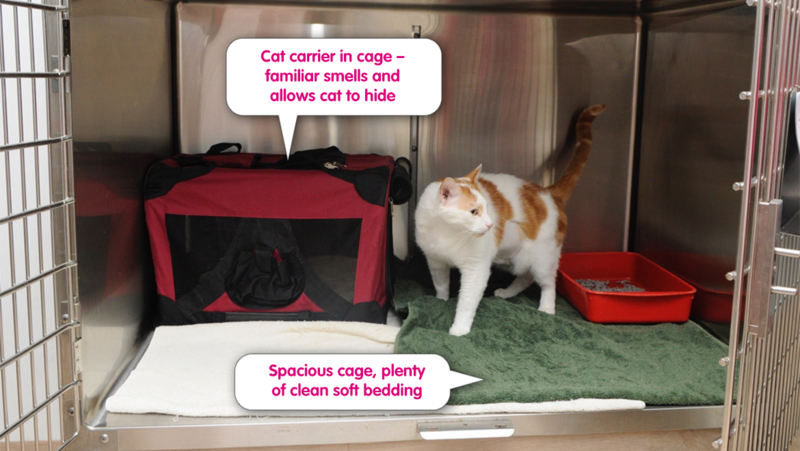 Cages constructed of metal mesh/bars can be used, but only if a clean, easily disinfectable cover is used to provide a sight and sneeze barrier. 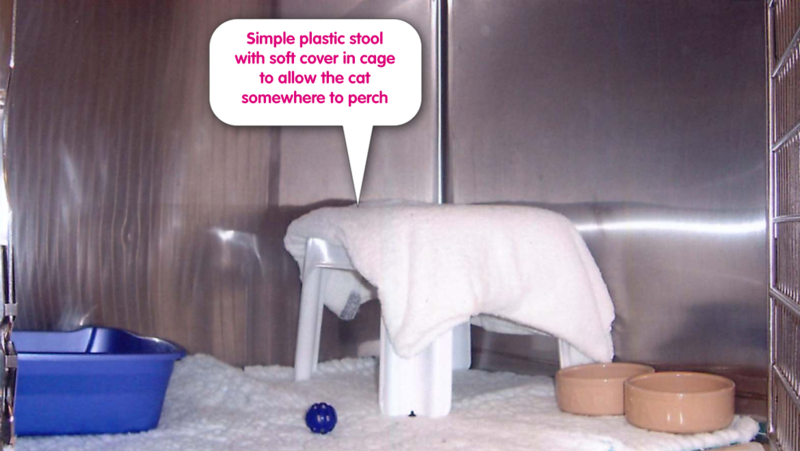 Mesh cages are not suitable for a Gold standard Cat Friendly Clinic, and a wire mesh floor is never acceptable – this must always be solid. 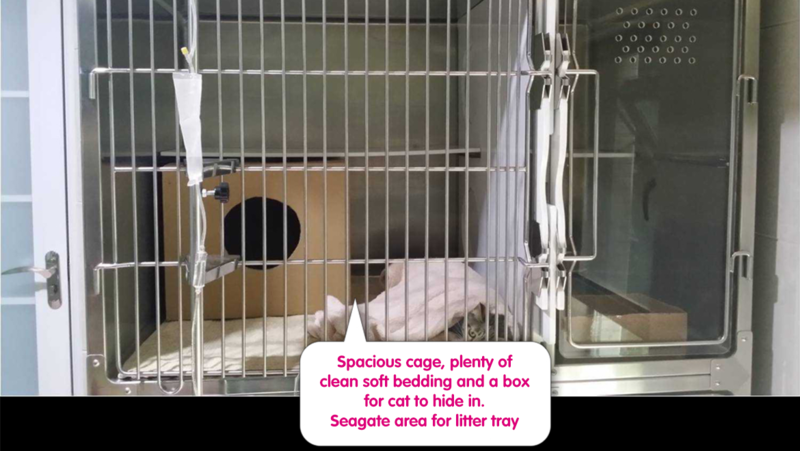 The cage size is an important criteria – a larger size allows more flexibility in the arrangement, a greater separation of resources (bed, water bowl, food bowl and litter tray), greater freedom and choice of the cat, and therefore greatly helps to reduce stress during hospitalisation. 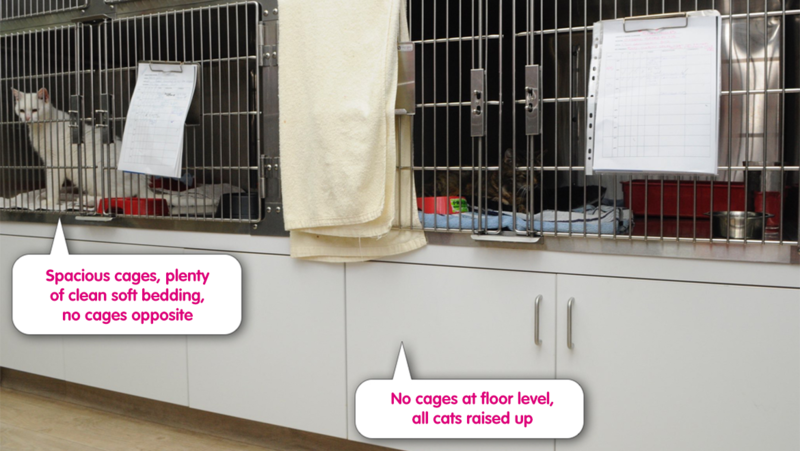 For ‘day patients’ (up to 24 hours stay), cages must have minimum internal floor area of 2700 cm² (eg, 45 x 60cm) and a height of 39cm. For cats staying longer than 24 hours, cages must have minimum internal floor area of 3600 cm² (eg, 60 x 60cm) and a height of 55cm. 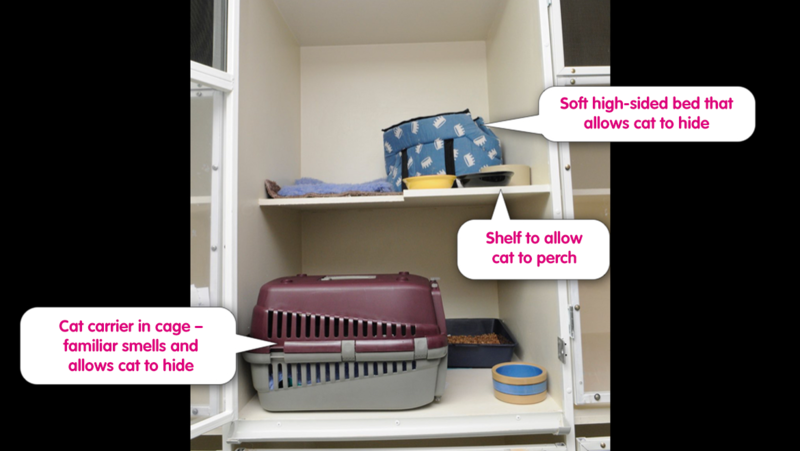 The floor surface area is the most important factor in the cage size, but the height is also an important consideration as cages with a greater height allow shelves, boxes or carriers to be placed in the cage providing somewhere for the cat to sit off the floor of the cage. For ‘day patients’ (up to 24 hours stay), cages must have minimum internal floor area of 3600 cm² (eg, 60 x 60cm) and a height of 55cm. 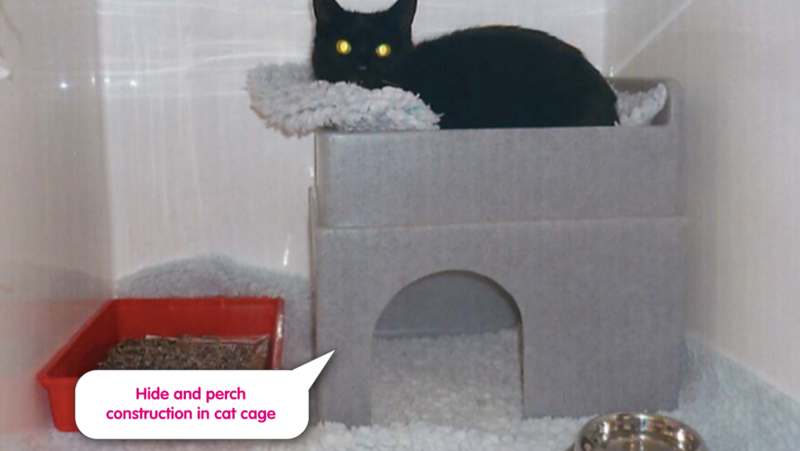 For cats staying longer than 24 hours, cages must have minimum internal floor area of 6300 cm² (eg, 70 x 90cm) and a height of 55cm. 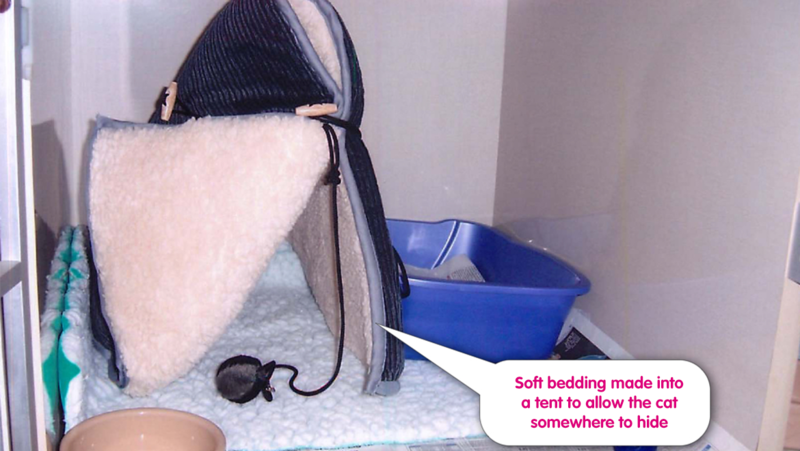 Comfortable soft bedding should always be provided – newspaper or disposable paper can be used to line the floor of a cage if required, but soft bedding (blankets, towels, acrylic bedding etc.) should be used over most of the floor to provide a soft comfortable surface. 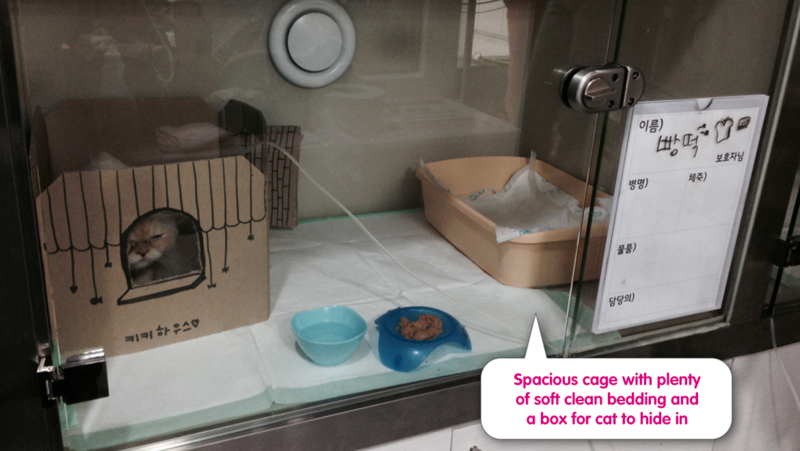 A resting area, food and water bowl and litter tray should be placed as far apart as possible in the cage. 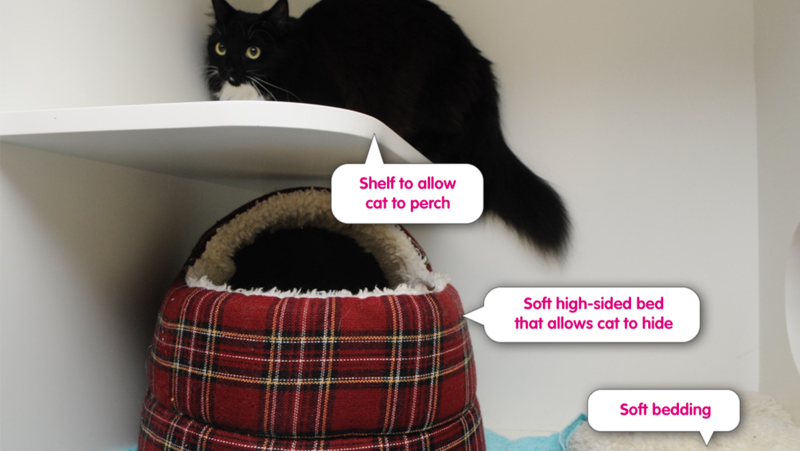 Making provision for the cat to hide is a very important welfare consideration – a ‘sack bed’, an ‘igloo bed’ or even just a cardboard box with appropriate high sides are all examples of this. 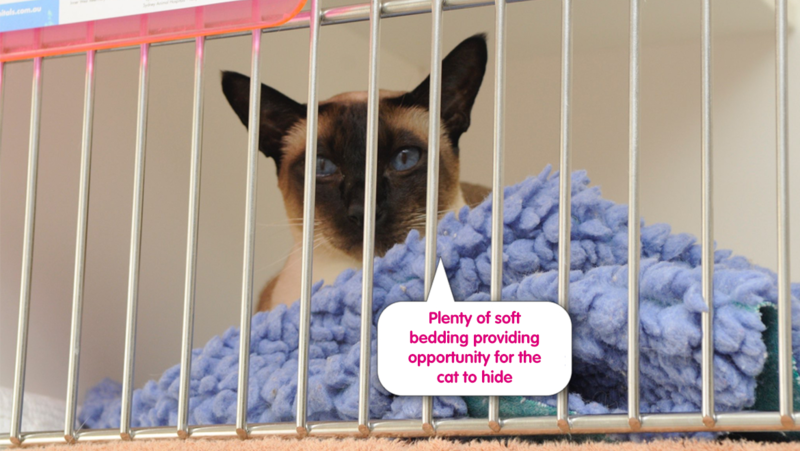 If a cat has the ability to hide in its cage this will significantly reduce stress and enhance welfare – this is a requirement for all Silver and Gold accredited clinics for cats hospitalised overnight or longer. Ideally, in addition to having somewhere to hide, providing facilities for a cat to sit up high will also improve welfare. This can be in the form of a shelf in the cage, a box that the cat can hide inside of or sit on top of, or perhaps even a cat carrier (eg, small wire cat basket) open on its side so the cat can go inside to hide or sit on top of.